Rational: Since the earliest human civilizations, people and nations have challenged their technical ability and resources to build imposing structures perceived to have a critical function in supporting the public good. 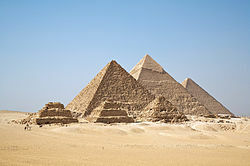 This is most evident in the five thousand years of architectural history standing in Egypt today. In this activity, students will research an example of architecture from various points in Egyptian history and produce a descriptive, narrative or persuasive writing reflecting their understanding of their assigned edifice.